But it means so much to those who wait"
At the time of his collaboration with the Brodsky Quartet in 1992, Elvis Costello had already dabbled in different fields within pop music, so further experimentation would hardly be a shock. 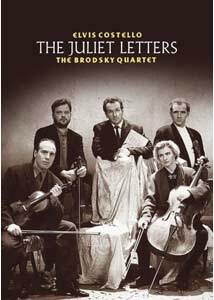 Still, working with a string quartet on a high concept song cycle was a little more than some fans and critics wanted, and there were plenty of condescending and snippy stories about the rocker dabbling in classical and vice versa for the Brodsky Quartet. In the years since the resulting album (The Juliet Letters), Costello has gone on to do further work in the classical field, including dance and opera work. The program presented on this Rhino disc blends interview material with several lip-synched performances of songs from the record, with a live performance thrown in for reasons unknown. The synched performances, which basically amount to music videos, all take place in the same set, with only clothing changes and lighting to differentiate them. Unless there were contractual reasons for it, I don't see why the opportunity wasn't taken to simply present a live performance of the material, which would have been of far more interest to most fans, I would think (or at least to me). The interview material is fine on its own, but if I want to hear the songs, I can simply listen to the actual album. The material itself gets its starting point from an article Costello read about a Veronese professor who had taken upon himself to write back to people who had sent letters to Shakespeare's Juliet. The actual texts of the songs don't have much to do with that concept beyond using the idea of letters as topics, and the songs cover a whole range of types of letter, from love letter to suicide note to begging letter and so on. The music styles are necessarily geared to each lyric, and as Costello comments, forced him take on characters and viewpoints he might not otherwise have ever considered. For those who consider themselves allergic to classical music, this isn't too difficult to get into; the music is all strings, of course, but Costello's distinctive voice is certainly a good distance from any kind of trained classical voice. At the same time, classical fans won't have to go too far to get into this either. Costello and the Quartet both emphasized that this wasn't either party's crossover work, it simply was it was, and I think that's fairly true. It isn't a favorite among Costello fans, or at least that's the impression I've gotten over the years, as his non-rock work seems to be something to be tolerated in between rock-oriented material. As a viewing experience, this quickly wears out its welcome; being that a string quartet is stationary, there isn't much one can do to liven up watching them, and director Philip King doesn't try, basically opting to have wardrobe changes now and then, and shoot from different angles, given a lack of camera movement. As such, it's a viewing experience best watched piecemeal, though I can't think of who would actually do that. One for the completists. Image Transfer Review: The show was presented in what looks like 1.66:1 widescreen, but a new anamorphic transfer was not done for this release, which really doesn't surprise. That being said, the image quality is okay at best, with okay colors and a minimum of defects considering the source. It looks like a videotape transfer, with all its attendant qualities (or lack thereof). It still shouldn't be acceptable for a DVD in this day and age, though. Audio Transfer Review: Two choices, PCM stereo and Dolby 5.1; I thought both sounded pretty good, considering the image quality, with good, vivid sound. These aren't going to blow the doors off your receiver and speakers, so to speak, but they're solid. Costello completists will presumably be the main market for this disc, as anyone else can pick up the actual album release. The music video format of the songs can get a bit tedious after few tracks, but the interview material breaks up the monotony. No extras and a nonanamorphic transfer are a bit of a letdown, though.